Thrive on impulse. 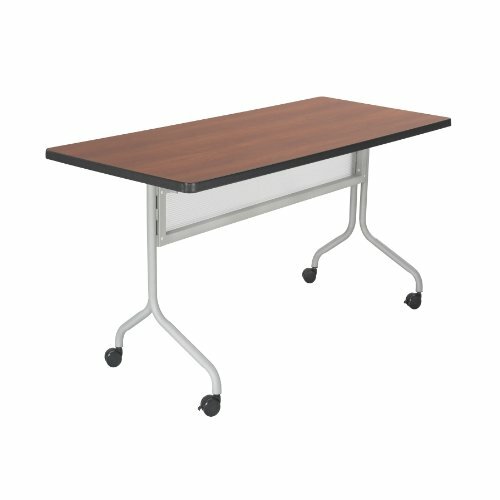 Impromptu Mobile Training Tables work together to create unique combinations for training sessions or conference meetings. 72"W x 24"D rectangle top of 1" thick high pressure laminate top with durable 3mm vinyl t-molding edge band. Top folds down easily for nesting and storage. 1 1/4" tubular steel base includes polycarbonate modesty panel. Mobile on four 3" dual casters, two locking. Meets or exceeds ANSI/BIFMA standards. Assembly required. Safco Products optional Ganging Connector Model 2060BL secures tables together (sold separately). Safco Products optional Power Module Model 2059BL provides three grounded outlets and two Ethernet data connections to your working area (sold separately).